You will have seen this photo before I’m sure. 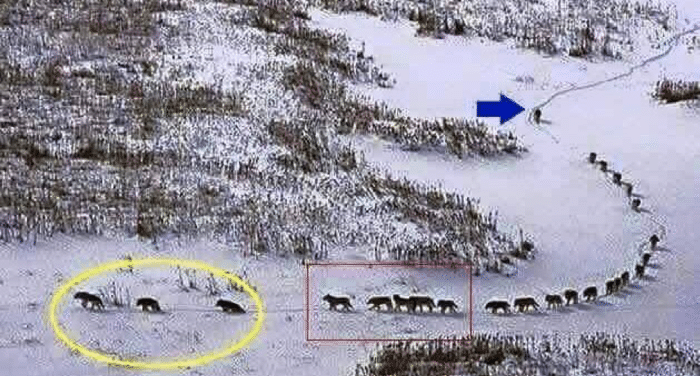 The three wolves in front are old and sick, walking in front to set the pace of the group lest they get left behind. The next five are the strongest and fittest, tasked with the role of protecting the whole group. The largest pack in the middle are always protected from any attack. The last group are also among the strongest and fittest; positioned to protect the group from the back side in an attack. The last wolf is the leader. He ensures no one is left behind. He keeps the pack unified and on the same path. He is always ready to run in any direction to protect and serves as bodyguard to the whole group. Symbolic of the theory that true leadership is not about being out in front and being the visible leader. It means taking care of the team. Sorry to destroy the myth, but this story is just a modern fabrication of one theory of animal behaviour. No-one knows the source and, likely, there is some truth to the theory. Animals have innate behaviours developed to protect the whole pack. Like tribal behaviour in many ancient cultures, and some modern, this team mentality is not just an attitude, it is platform upon which all other actions and behaviours are developed. Drawing parallels to modern day business, where do you place yourself in the line of wolves? In large businesses, the front running team are often the directors, management and investors; older, slower, less in touch with modern technologies, removed from what is actually happening at other levels. These people feel like leaders, behave like the leaders their icons and predecessors did and rarely look back. The second group could be likened to middle management, tasked with following the leaders closely whilst also trying to manage the group behind. This group are often too busy to develop their own skills or find time to train, learn and develop new ideas as they feel pressure from the leaders to implement their policies. The largest group comprises the workforce, the main hub of activity in terms of productivity; heads down, meeting deadlines and fulfilling projects, this group of employees IS the business. The last group are the disenfranchised members of the business. Those who once ran fast to try to catch up to the first pack to share ideas and offer new ways of doing things but were told to ‘get back in their box’. The last group are the ones who are looking for an exit; tired of not being valued or appreciated. Are you a leader running out in front, pulling the team along without looking back? Are you the leader who runs with the team or the middle management? Or are you at the back of the pack keeping the last group included and valued? Is it time to rethink your version of leadership? Being a great leader is not always measurable. You can Google the top ten traits of great leaders and easily arrive at the usual lists. But being an AMAZING leader is more than that – it is being different, being relatable and tuning in to the unique circumstances that make up your own individual business. There is one simple rule when it comes to checking that you are developing into a great leader; ASK others. Ask your team, ask your clients, ask your peers. You will be on a networking group or business development group, of course, so ask your peers. Do a survey with your whole team and ask for honest, anonymous feedback. If you do not ask for feedback, how can you know what people really think? Do not assume, if you have been in your role for a while, that you know what you are doing and that you are right. Do not be deluded by ego or ignorance. True leaders have one thing in common – the ability to reflect. It is only by asking questions, of yourself, of procedures and of industry, that you can improve and find success. Which wolf are you then? And is your place in the pack valued and effective? Ask the question and be prepared to change. You may be surprised at the response.